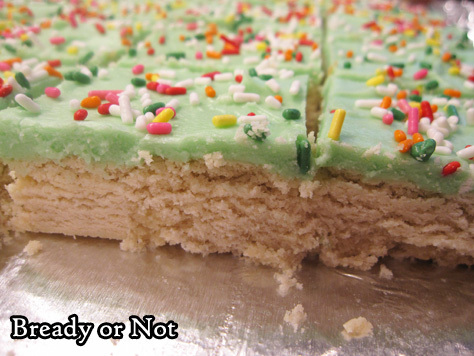 Frosted sugar cookies are awesome, but let’s be honest–they are kind of a pain. Individual cookies that need to be frosted individually. It’s time-consuming and messy. Simplify the process! 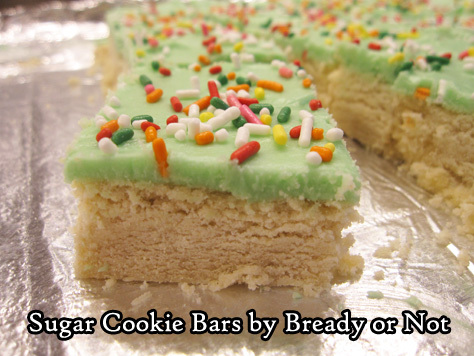 Make sugar cookie bars. Bake up the whole pan in under 25 minutes. Let it cool. Frost. Slice. EAT. The cookies are like shortbread in texture, buttery and firm. 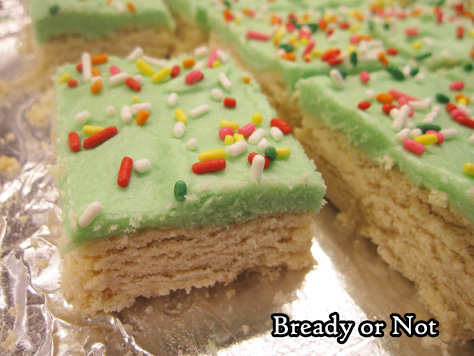 The frosting layer is just the right thickness and sweetness. Color the frosting however you wish; I like to use Americolor dyes. And sprinkles. Sprinkles make everything better, right? 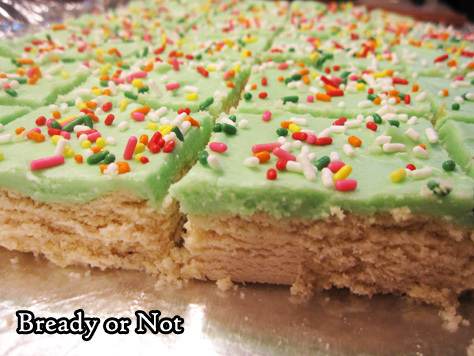 The end result is a basic and delicious frosted sugar cookie. They’re easy to pack for a party or potluck, too–stack them in a container with wax paper between the layers! If you need a lot of frosted sugar cookies in a hurry, this recipe is exactly what you need! 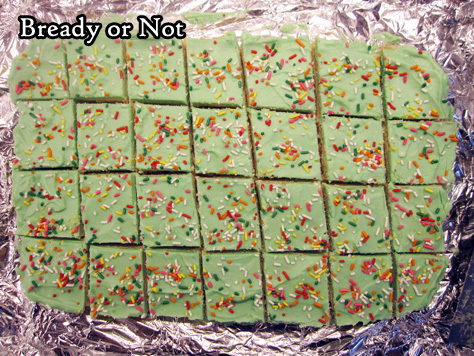 Bake up the shortbread-like cookie layer, let it cool, then frost the entire pan before slicing them into bars. Preheat oven at 350-degrees. Line a 9x13 baking dish with aluminum foil and apply nonstick spray. In a large bowl, beat together the butter and white sugar until fluffy. Add the egg and both extracts, then the dry ingredients. Mix until just combined. Evenly compress the dough into the prepared pan. Bake for 20 to 25 minutes, until the edges are golden brown. Completely cool. To make the frosting, beat together the butter, confectioners' sugar, vanilla, two tablespoons milk, and a few drops of food dye. Add more milk to reach a spreadable consistency. Lift the uncut cookie bar out by the foil, then spread frosting on top. Add sprinkles. Slice bars. Store in a sealed container, stacked between wax paper layers. Sunday Quote says Happy Earth Day! Posted by Beth on Apr 22, 2018 in Blog, Quote | Comments Off on Sunday Quote says Happy Earth Day! If you love apples and oatmeal cookies, this unique recipe combines those loves in a delicious new form! 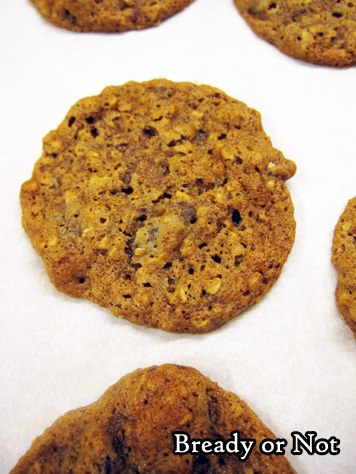 These Apple Butter Oatmeal Cookies are thin and super chewy. Don’t substitute applesauce here. You need real apple butter, homemade or store-bought. The dough can be finicky to work with. I use well-seasoned stoneware for my cookies, and I was surprised that my first batch completely stuck to the pan. After over a decade of seasoning the stoneware, that almost never happens! The solution is simple: parchment paper. 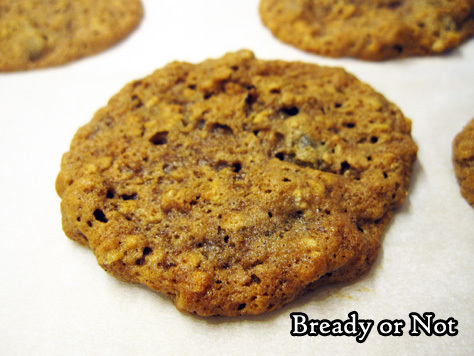 Keep it on the paper to bake and to cool, allowing the cookies to completely set. That doesn’t take long. 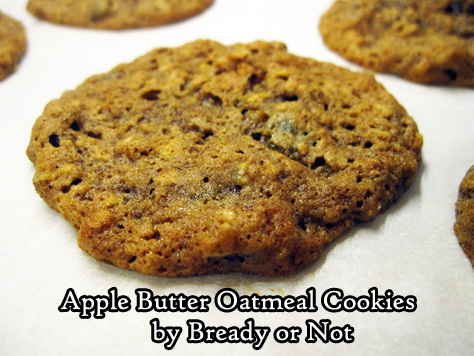 The end result is a thin, chewy oatmeal cookie with a rich apple flavor. I’ve never had anything quite like them! 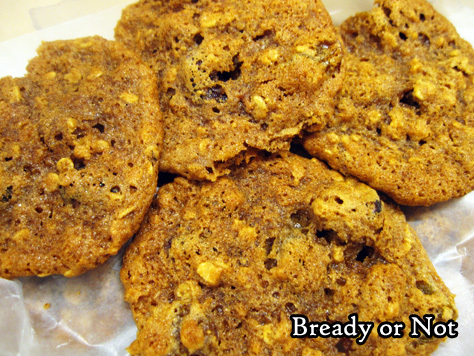 Modified from Apple Butter Cookies in Best Loved Cookies & Bars by Taste of Home. These Apple Butter Oatmeal Cookies require several hours of chill time prior to baking, and the use of parchment paper throughout the baking process. The dough can be sticky and finicky to work with, but the delicious result makes the effort worthwhile! In a large bowl, cream together the butter and sugar. Beat in the egg, oats, and apple butter. In a separate bowl, sift together the dry ingredients. Gradually mix them into the butter mix, followed by the pecans and raisins. Cover dough with plastic wrap and refrigerate for several hours or overnight. Preheat oven at 350-degrees. Prepare a baking sheet with parchment paper; note that the paper is a necessity, as this dough is very sticky. Scoop dough by teaspoonful, with lots of space between each dollop to account for spreading. Bake for 15 minutes or until set. Use parchment paper to lift the cookies onto a rack to cool, and put fresh paper on the cookie sheet. Prepare the next batch. 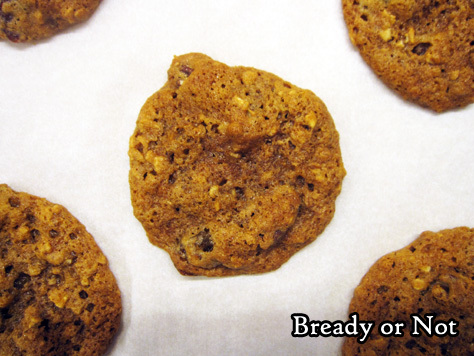 By the time the next cookies are baked, the previous batch should be set and ready to move off the cooling rack. Pack cookies with parchment or wax paper between layers, as they might stick together.